PAT WAKSMUNSKI/Special to the Sun-Gazette Penn State’s Noah Cain runs with the ball during Saturday’s Blue-White game at Beaver Stadium. 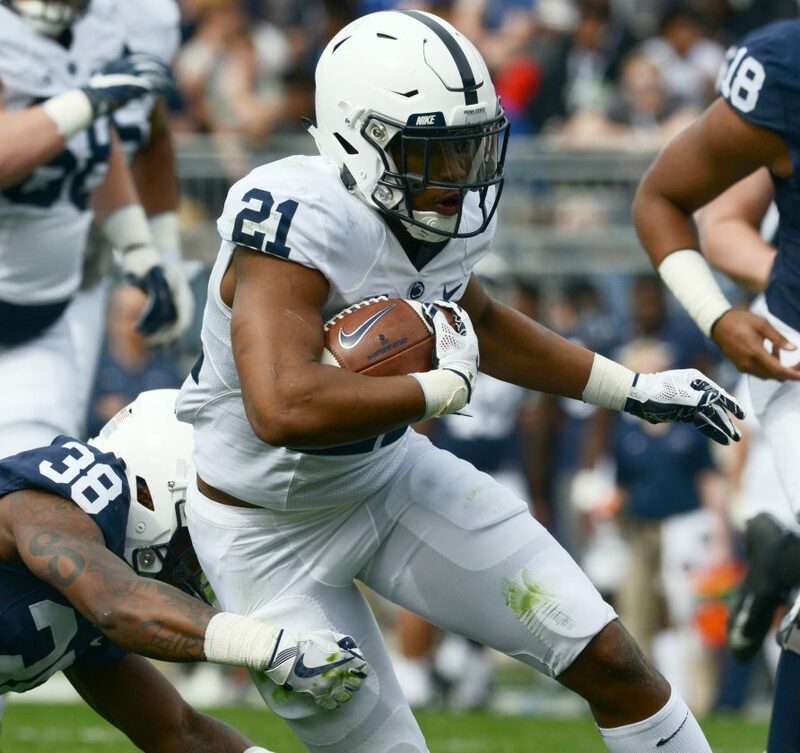 STATE COLLEGE – True freshman tailback Noah Cain showed he’s able to do some special things running the ball, and quarterback Sean Clifford did, as well, during the Blue-White Game. Cain had a tough run on his two-yard touchdown against the Blue in the second quarter. Then in the game’s closing minutes, he caught a screen pass from Clifford and bulldozed his way for an 8-yard score. Slade had a one-yard TD run for the Blue, and the best highlight of the day came when Will Levis threw a 59-yard TD pass to wideout Dan Chisena in the third quarter. Coach James Franklin announced seconds later that Chisena, a walk-on, was being put on scholarship. That meant Clifford got most of the reps with the Blue team, and he turned in a solid day. He finished 11 of 19 (two passes were dropped) for 118 yards and one touchdown. Franklin was asked after the game if he’s ready to name Stevens as the starting quarterback, which most expect to be the case to open the season in 4 1/2 months. “Tommy has so much invested in this year, and we know that this is his last shot,” Tom Stevens told the Centre Daily Times newspaper. “If he’s not Penn State’s quarterback, he’s going to be somebody’s quarterback.